Cathedral Square (Russian: Sobornaya ploshchad) is the central square of the Moscow Kremlin where all of its streets used to converge in the 15th century. 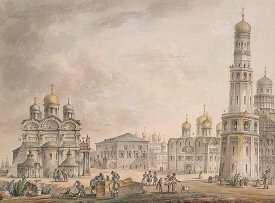 The square owes its name to the three cathedrals facing it - Cathedral of the Dormition, Cathedral of the Archangel, and Cathedral of the Annunciation. Apart from these, the Palace of Facets, the Church of the Virgin's Robe and the Church of the Twelve Apostles are placed there. The tallest structure on the square (and formerly in all of Russia) is Ivan the Great Bell Tower, which also separates Sobornaya Square from Ivanovskaya Square. The Cathedral Square is famous as the site of solemn coronation and funeral processions of all the Russian tsars, patriarchs, and Grand Dukes of Moscow. Even today, the square is used in the inauguration ceremony of the President of Russia. The square is also the scene of the daily changing of the Horse Guards (a spectacular imperial tradition restored in the 21st century). Occasionally, operas (such as Boris Godunov) are performed in the majestic setting of the historic cathedrals as well. This page was retrieved and condensed from (http://en.wikipedia.org/wiki/Cathedral_Square_in_Moscow) see Wikipedia, the free encyclopedia, December 2007.